The Bilsdale mast stands high above the hills of the North York Moors. The Bilsdale transmitting station is a broadcasting and telecommunications facility, located at Bilsdale West Moor above Bilsdale, close to Helmsley, North Yorkshire, England. It includes a guyed steel tubular mast that is primarily used for radio and television transmission. The height of the mast is 314 metres (1,030 ft) to the pinnacle. It is among the most powerful in the UK at 500 kW ERP and has recently been equipped with new aircraft warning lights, in the form of arrays of ultra bright red LEDs. 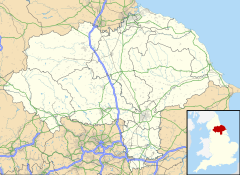 Bilsdale was constructed in 1969 by the BBC to bring 625-line colour television on UHF to Teesside and the surrounding areas for the first time. Having added UHF TV to the existing VHF TV stations at Pontop Pike and Emley Moor, it was quickly established that a new station would be required to cover County Durham and north North Yorkshire where existing coverage was poor, and thus the new station was built. It was built by J. L. Eve Construction. Coverage extends throughout Teesside and the surrounding regions, encompassing north North Yorkshire and southern County Durham. This includes Harrogate and York to the south, Filey and Whitby to the east, Middlesbrough, Stockton, Darlington, Bishop Auckland, Hartlepool, Peterlee, some areas of Seaham and some areas of Sunderland to the north, and Barnard Castle and Worton to the west. In July 2007, it was confirmed by Ofcom that the television frequency assignment after digital switchover would be such that a wideband or group K aerial would be required for reception of all six multiplexes. However, the three public service multiplexes would still fall within the station's original analogue frequency range assignment of aerial group A. The digital switchover started at Bilsdale on 12 September 2012 and was one of the last transmitters in England to complete this operation on 26 September 2012, the others being Pontop Pike and Chatton in the same region. Analogue television is no longer available from Bilsdale; BBC Two was closed on 12 September 2012, followed by the remaining four channels on 26 September 2012. Below is a list of transmitters that relay Bilsdale. ^ "Bilsdale Transmitter". ATV aerial sales. Retrieved 23 December 2015. ^ "The Big Tower Bilsdale". The Big Tower. Retrieved 23 December 2015. Info and picture of Bilsdale transmitter. Views of Bilsdale from Anorak's Guide to Radio in North Yorkshire.